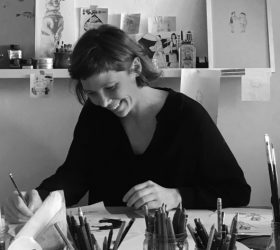 Julia Dürr was born in Frankfurt am Main and studied illustration in both Münster and Brussels. In 2007, while still a student, her first picture book was published. Her passion for form, colours and places to spend time near water have taken her to a number of different cities. Since 2013 she has been based in Berlin where she works as a freelance illustrator. She has been a recipient of awards from Stiftung Buchkunst and the Academy of Children’s and Young People’s Books. She met the author, Astrid Walenta, on a book tour in Zürich. “Madame Fafü” is their second collaborative book.